High-thread-count sheets and chocolates on the pillow are nice touches to find in a hotel, but we can think of no amenity more important than a fine restaurant. Guy Savoy and Joël Robuchon are just a few of the top chefs that offer their elevated cuisine at hotels around the country. We’ve narrowed down the nation's best options for hotel dining to present to you the top 10 U.S. hotel restaurants. 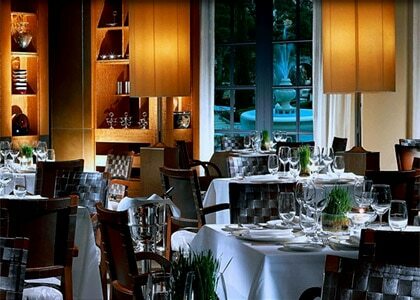 Besides the food, we also use the décor, ambiance, level of comfort and the hotel itself as criteria for our selections.